The ultimate comfort food must be tasty extra rich creamy mashed potato. Eaten as part of a meal, or on its own as a snack, there is no doubt that this dish is one of the nation’s favourites. For many years pie and mash, sausage and mash and countless other meals have proven that mashed potato is a delicious addition to any meal that can be eaten by young and old alike. Always use old potatoes never the new varieties. Ensure that the potatoes are peeled properly and all eyes and blemishes are removed. Cut the potatoes into even sized pieces and place into salted boiling water and cook until a fork can slide easily into the potato to show it is cooked. Potatoes are a staple food and can accommodate most forms of diet. For someone following a calorie controlled diet swap the cream or whole milk for skimmed or semi skimmed milk. The addition of herbs and seasonings can enhance the recipe without adding calorie or fat content to the recipe. Place the potatoes into the boiling salted water and cook until tender. Make sure that the water is not boiling too ferociously and that the potatoes are covered by the liquid at all times. Remove from the heat and drain. Using a fork break up the potatoes until there are no large lumps. Add half the butter and cream and using a whisk start to whip the potato. Add the remaining butter and cream until the mixture is thick and creamy. Potato Ricer - is a gadget that makes light work of mashing potatoes. For those that find mashing a chore or due to arthritis are unable to easily use a fork to mash a potato it is well worth trying this useful kitchen aid. Food Processor - some people use a blender or food processor to mash their potatoes. This is an easy way to complete the task but care must be made that the potatoes have cooled enough before being out into the machine and also that they are not over processed or the potato will resemble a very runny mash. 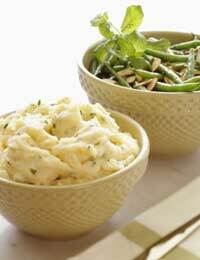 Hint - if your mashed potato should become too runny add a little dried mashed potato mix to bring it back to an acceptable consistency. Dried mashed potato is an ideal store cupboard basic for thickening soups and stews. Add a quartered onion to the potatoes at the boiling stage. When soft remove and chop finely and mix in with the mashed potato along with a strong mature cheddar cheese to make a warming tasty cheese onion and potato pie. Top with more grated cheese a sprinkling of black pepper a sliced tomato and place under the grill for a sizzling presentation. If you have any leftover mashed potato add some chopped cooked cabbage (or brussel sprout) form into patties and fry until brown in a pan with a little butter for delicious bubble and squeak. Place the mashed potato into an ovenproof dish making four wells. Into each well break an egg. Sprinkle with grated cheese and place in the top of a hot oven until the eggs are cooked and the cheese have browned.